Truth be told, we are very new to the concept of data expeditions. But one look at the above description and it is something we are very much on board with. For more on the methodology, take a look at this guidance from School of Data. 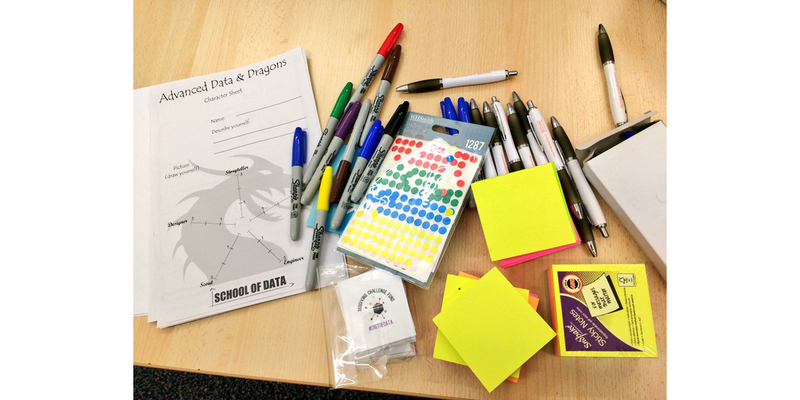 We were thrilled to host a group of East Sussex based funders (including local government, community foundations and national foundations) and 360Giving for an afternoon Data Expedition. The theme of the afternoon was “Community Resilience” – purposefully broad to encompass a wide range of questions and curiosities. With Mor Rubinstein, Data Labs and Learning Manager at 360Giving as our guide, plenty of coffee and a plethora of CSVs – we were on our way. What has stuck with us since? A few thoughts below. Ask “why?” a lot: Put yourself in the shoes of an inquisitive 3 year old. Understanding the motivation behind the question can help to reframe it in a different way, encourage new approaches and new outlooks. Bite the bullet and choose one question to focus on: It might not be the right question – but it might lead on to something more interesting and relevant to you. Make mistakes! : It’s OK to go down the wrong path sometimes. Learn from it. Use it to refine your approach. Assign a rabbit hole manager: What a title eh? For those times when the discussion has gone so off piste that you’ve ended up in a different mountain range, it is useful to have somebody there to refocus everybody to the task on hand. 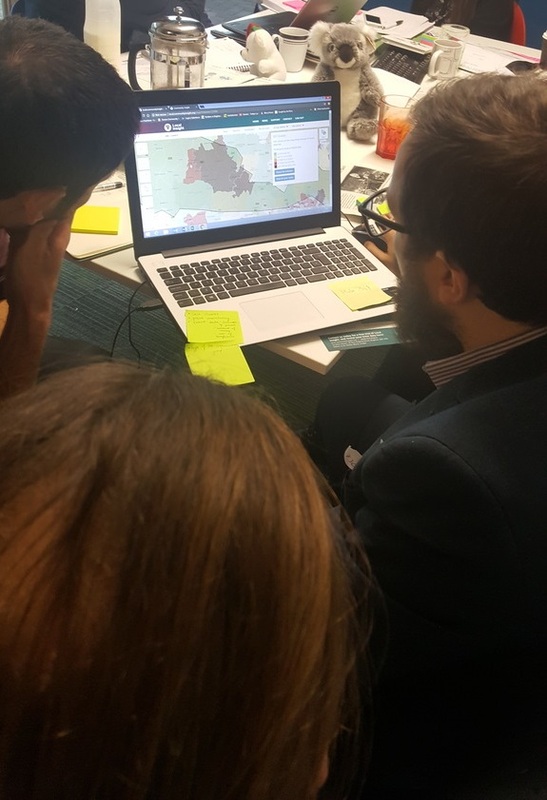 One of the groups had the unenviable task of tackling “what is a community?” One challenge being the disparity between how communities are defined “top-down” by government agencies (in the form of electoral wards, LSOAs etc.) and then how they are understood by the communities themselves. Add the weight of a sense of belonging, local social relationships and socio-cultural group identities to the mix, and the boundaries of communities become fuzzier and fuzzier. Flexibility shone through as a key factor here. The ability to be able to test assumptions and change community “boundaries” and for these to be arbitrary – not necessarily fitting to standard areas. 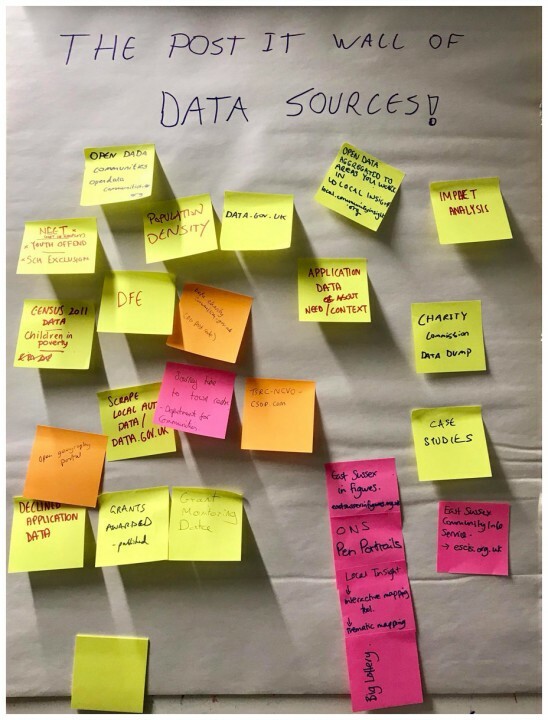 Also the flexibility to use data from a wide range of sources; both quantitative and qualitative to build a picture of a community’s strengths, characteristics and their needs, with no one dataset able to tell you the story of a community. On one side of the coin is the importance of getting qualitative information about local communities by tapping into community networks. And on the other side, is strengthening knowledge of the underlying context of the area in which communities reside. This is one of the areas we hope we can support grant-making organisations in evidence-based decision making; through instant and easy access to hundreds of local level datasets (you can explore some of them here), matched to neighbourhoods and communities defined by you, in any way you like. All of this rich data can be complemented by the data you already hold; such as where you are funding (and where you are not), how much you are funding, and what type of beneficiaries you are serving. Get in touch for a free trial of Local Insight if you’d like to know more. And then there is There Post It Wall Of Data Sources too! We all live busy work lives. Ever connected to incoming calls, emails and growing task lists. Finding the time to take an afternoon to step back and do something important but not urgent can be really difficult and daunting. 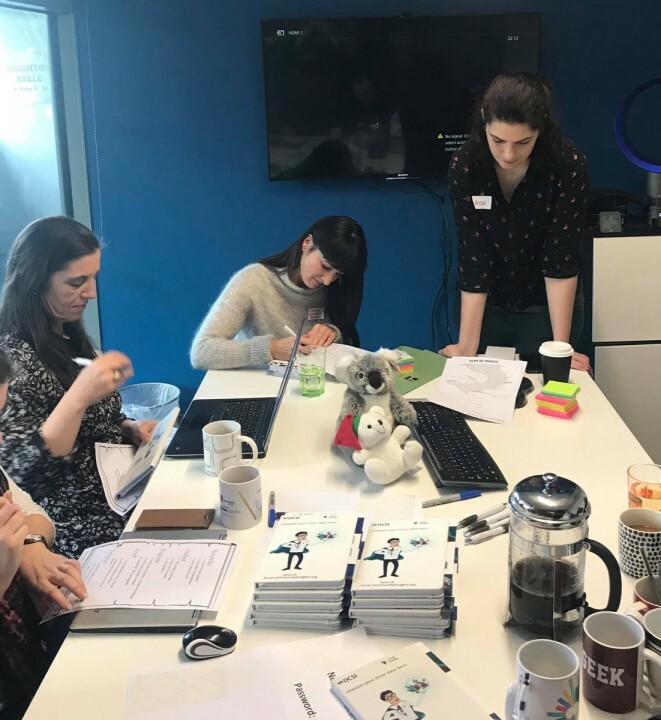 However, after listening to each group’s feedback on what they had discussed and the outputs groups had put together, it feels that an afternoon is a small price to pay in order to benefit from exposure to new skills, new ways of thinking, and crucially new ways of doing. sharing findings and creating a resource for go-to data sources. All in all, it was a great way to spend an afternoon & we look forward to seeing where the expedition takes East Sussex funders next. How are Community Foundations benefiting from Local Insight? Neighbourhood estimates on health conditions: What’s the story in your area? To receive updates on OCSI projects, sign up to our mailing list.